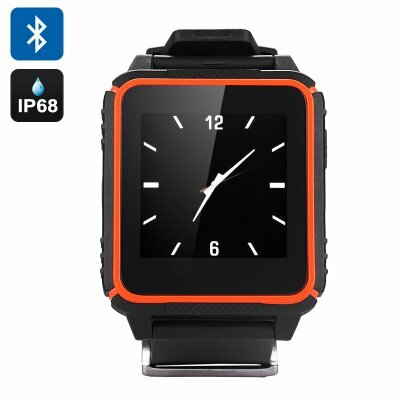 Successfully Added Waterproof Phone Watch 'TrekSmart' - GSM, 1.54 Inch IPS HD Screen, IP68 Android + iOS, Sleep Monitor, Pedometer (Orange) to your Shopping Cart. Make quick calls on the go, manage your fitness activity and get instant updates – all thanks one simple accessory that conveniently sits on your wrist. The GSM watch comes with lots of great features and is waterproof. This 'TrekSmart' stylish smartwatch with a 1.54 HD touchscreen is not only a great looking accessory but also a functional one. It features quad band network coverage and lets you make and pick up calls right on your wrist. That’s a great option to have available when you prefer not to take out your phone – even more so with the watch’s IP68 ranking. It’s dust tight and can even be submerged in water. This makes the gadget perfect for the great outdoors or a trip to the gym. Pair the watch to your smartphone for even more functionality. You will be able to track your heart rate, use it as a remote trigger and sync messages if you are using an Android phone. Moreover, the watch will kook after your sleep with the Sleep Monitor and make sure you don’t spend too much time at the desk with Sedentary Reminder. Equipped with the MTK2502C processor, the smartwatch will offer you seamless operations, and navigation will be a breeze thanks to the 1.54 HD touch screen. Non-stop usage time is up to 6 hours or about 96 hours on standby with the 300mAh battery. The GSM watch phone will look great on your wrist, safely secured in place with a flexible wrist band. A bright orange frame accentuates the accessory making it noticeable – yet still elegantly simple and fit for any style. The 'TrekSmart' Waterproof Phone Watch comes with a 12 months warranty. Brought to you by the leader in electronic devices as well as wholesale phone watches..